Traverse City Condo Rentals, LLC. offers Peninsula Bay Resort Condominiums on East Bay. 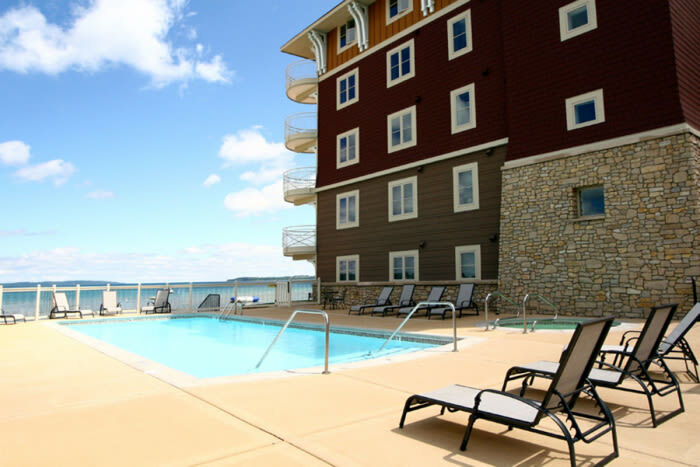 These newer luxury accommodations are second to none on East Grand Traverse Bay. Beautiful condos many with spectacular views of East Bay. Complex enjoys a heated outside "bayside" swimming pool and hot tub plus over 300 ft of East Bay shoreline. Rooms enjoy top-of-the-line appliances, granite countertops, vaulted ceilings, central A/C, full size wash/dryers and beautiful furnishings. Visit our website for photo slideshows and descriptions on each of Peninsula Bay's 18 rental suites. Peninsula Bay accepts winter long term leases and is open year-round.